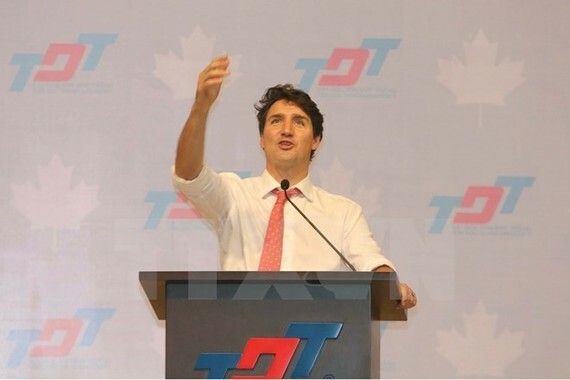 Canadian Prime Minister Justin Trudeau had a talk with students of the Ho Chi Minh City-based Ton Duc Thang University in the afternoon of November 9. During the event, the PM stressed the sound partnership between Canada and Vietnam while expressing his hope for the further development of the ties. He said he supports students, who speak out their voices and make efforts in learning. Trudeau urged them to think about the world today and in the future and to face their difficulties in life instead of avoiding them. He talked about his travel across the globe, noting that he finds Vietnamese people hospitable and friendly. Sharing his thoughts on benefits of immigration, Trudeau said Canada has issued policies to protect the safety of its citizens and hoped the younger generation will think more positively about the matter. He also highlighted a need to respect cultural diversity among nations and to balance economic benefits and environmental protection for sustainable growth.